Welcome to part 2 of our Etosha National Park series. Today we are looking at game viewing, how to get the best out of your trip and the rules and regulations of the park. Located in northern Namibia, 5 hours’ drive from Windhoek, Etosha National Park is home to nearly 114 mammal and 340 bird species. You can see cheetahs, jackals, giraffes, zebras, springbok, hyena, wildebeest & kudu as well as four of the big five (Buffalo are not found in Etosha). There are also 16 species of amphibians and 110 species of reptiles and even one species of fish which interestingly enough increases up to 49 species of fish during floods! The best time of the year to visit Etosha is from May to October…it is generally cooler and animals are far more likely to visit the waterholes as the park is dry due to it not having rained in this time. 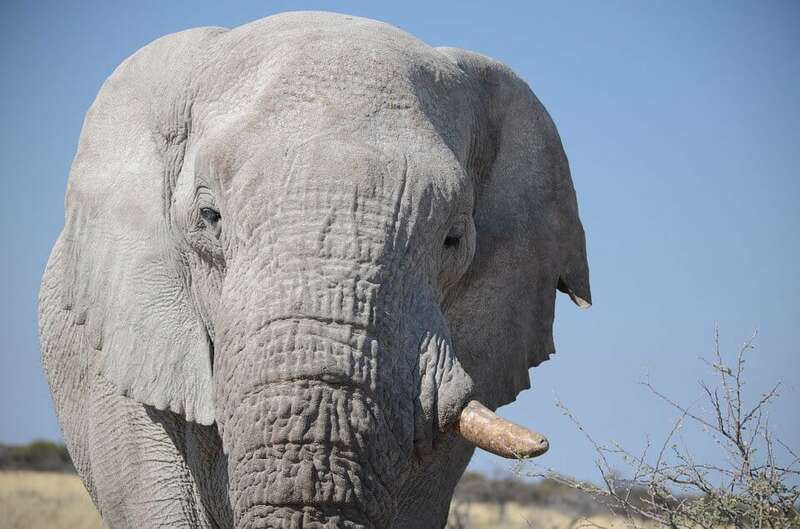 Elephants – Said to be the home to the tallest elephants in Africa, Etosha’s elephants reach up to 4 meters tall at the shoulder. Up to 2000 elephants roam the park and have flourished in the desert environment. Often referred to as the ‘’white ghosts of Etosha’ as these elephants cover themselves in the white clay dust. The entire elephant appears white and it quite a sight to see these giant ‘ghost like’ pachyderms. Lions – Up to 750 lions live in Etosha. The lions in western Etosha are the most ferocious in the park. Leopards – While leopards tend to hide out in dense brush whenever they can, they can be spotted at Etosha. Chances of spotting them are higher at night as they are nocturnal predators. 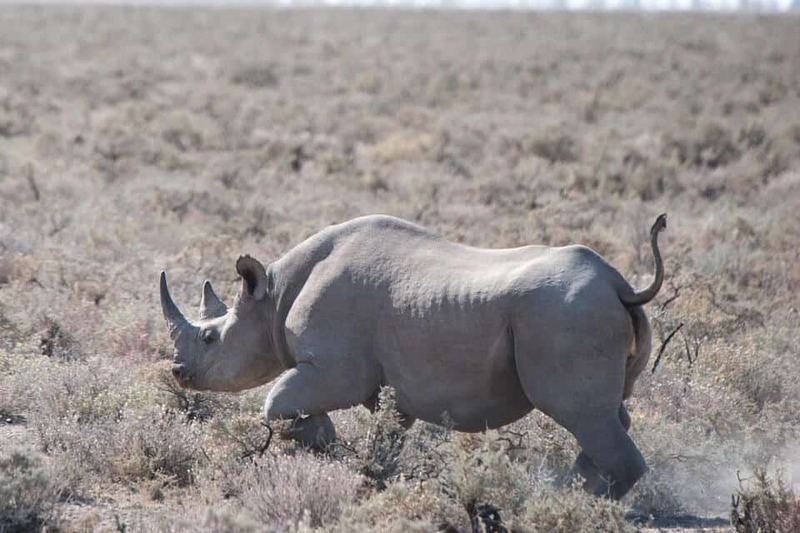 Rhinos – There is a healthy population of black rhinos at Etosha. While white rhinos have been reintroduced, they are rarely seen. However, they may be spotted at certain watering holes if you are lucky. There are over 80 watering holes scattered across Etosha. The southern fringes, near the rest camps are where you will find the majority of the waterholes. It is best to simply locate one of the many watering holes and wait for the wildlife to come to you. Bear in mind, though, if you are not the only vehicle “lying in wait” to see what comes by, the wildlife may be tempted to find a different watering hole if it is too crowded. Get a map of Etosha. This will be of great help in locating the various waterholes and how to get there. Take a pair of binoculars if possible. Slow down if you see other cars that have stopped on the side of the road. There is a good chance that they have spotted some wildlife and you can share in their sighting. Peak drinking times are usually early mornings and late afternoons/early evenings. If you view game in the early morning you have a chance of seeing some of the nocturnal animals which come to drink water after a night of hunting. This includes Bat-eared foxes and Aardwolves. 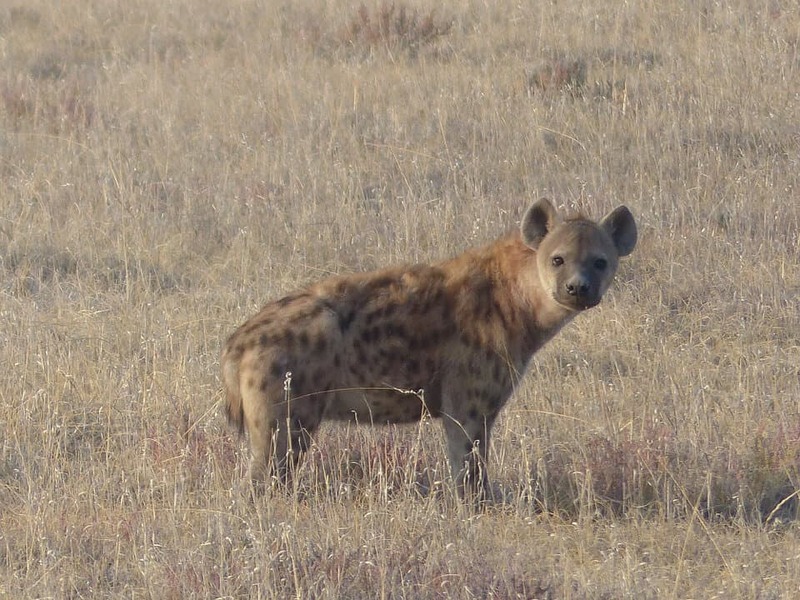 The rest camps in Etosha all have animal sighting books…take a look at these for what was spotted and where before you head out on your game drive in Etosha. Night time game drives can be very exciting in Etosha and this is when you may see some of the nocturnal animals such as honey badgers, bush babies, leopard and porcupines. Please note if you want to do a night game drive you will have to do it with the parks on their vehicles. You may not drive around Etosha at night on your own. It is good etiquette to remain silent around waterholes. Keep an eye on the behaviour of the game. 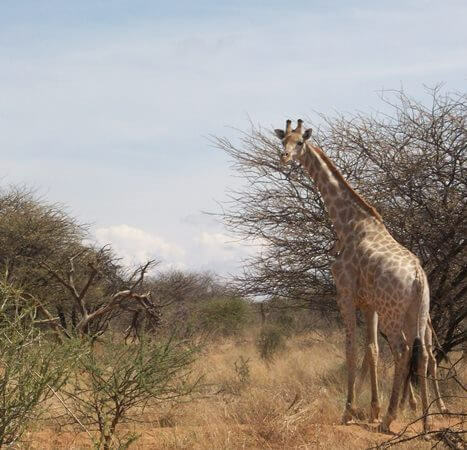 Giraffes with their height advantage will often spot a lion first. Antelope will also give away the presence of lions or other big cats lurking nearby. Keep an eye on the landscape around the waterhole for animals approaching to drink. Keep a look out under trees. Many animals will seek shade from the hot Namibian sun and often wildlife can be spotted resting under a tree in its shade. 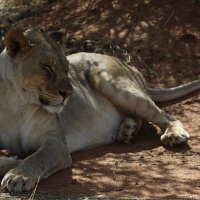 Lions will often laze around under trees. Vultures circling above indicate a kill. Never get out of your car whilst in the park. Don’t feed or interact with any of the animals from your car. Remember at all times that these are wild animals. Drive slowly – it is very easy to miss game as they often blend in so well with their natural surroundings. You have a much better chance of spotting game whilst driving at a slower speed. Relax, and take your time. A few hours spent sitting quietly will give you more chance of seeing wildlife than hours driving around. It is better to visit Etosha in an off-road vehicle although it is possible to drive in Etosha in a smaller city type vehicle. A 4×4 is not required though and the gravel roads in Etosha are generally well maintained. Drones are not permitted in the park. Patience really pays off, with a little luck. There isn’t really a “best waterhole” as this changes almost hourly. 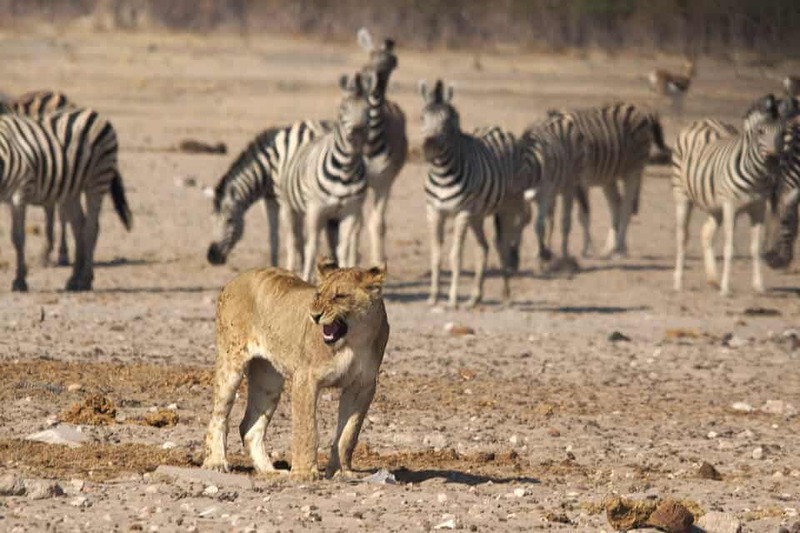 Don’t focus on the big four – there is so much more to Etosha. Drive slowly, and wait at waterholes. Find a good spot and turn off the engine. There is much to be seen if you just wait. Etosha has it all! There are quite a number of rules and regulations in place for your safety. Make sure you stick to them. For accommodation options in and around Etosha click here. Alternatively, contact us should you require any further information. If you’d like to share your Namibian travel story with us, please send your story to tim@brochuresnamibia.com and include at least one image no bigger than 1 MB.